Sunset by Fredrix Matte Canvas brings the expertise of LexJet and Fredrix together for a breakthrough in canvas, featuring one of the highest white levels available for an OBA-free canvas. It’s easy to work with for stretching, mounting and framing, and is ideal for fine art and photographic reproductions on canvas. The acid-free, pH neutral, poly-cotton base provides consistency throughout the print run. 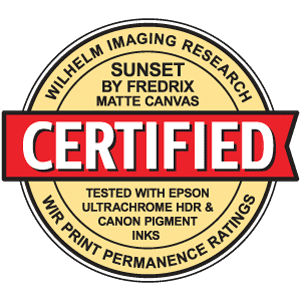 Light Fastness Sunset by Fredrix Matte Canvas has been granted archival-quality certification by Wilhelm Imaging Research, Inc., to last up to and beyond 200 years when printed with Epson UltraChrome HDR pigment inks or Canon LUCIA EX pigment inks. The fading time of ink jet ink is a direct result of the inks that you choose, as well as the environment where the print is displayed. All dye-based inks fade noticeably under direct sunlight and in interior applications where direct sunlight may fall on the image, and/or, where fluorescent or other UV lighting is present. Although the fading process is inherent in all ink jet inks, certain UV enhanced inks, pigment-based inks, and UV inhibiting coatings will extend the longevity of ink color. 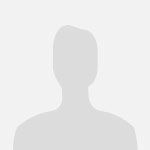 Contact the ink manufacturer to determine a specific ink's suitability for a particular application. Finishing/Post Processing No post processing or finishing is required on this canvas, however, a clear fixative, such as LexJet Sunset Coatings, may be applied to enhance certain areas of the print. We manufacture for an ETSY shop and use lots of this canvas. It is consistent, wraps well and has the benefit of the archival certification. I highly recommend it. I have printed and stretched over 100 images using this product and the desired expectations of my clients and myself have always been met.